Three years in the making, three Andrews and three massive days out in the hills. 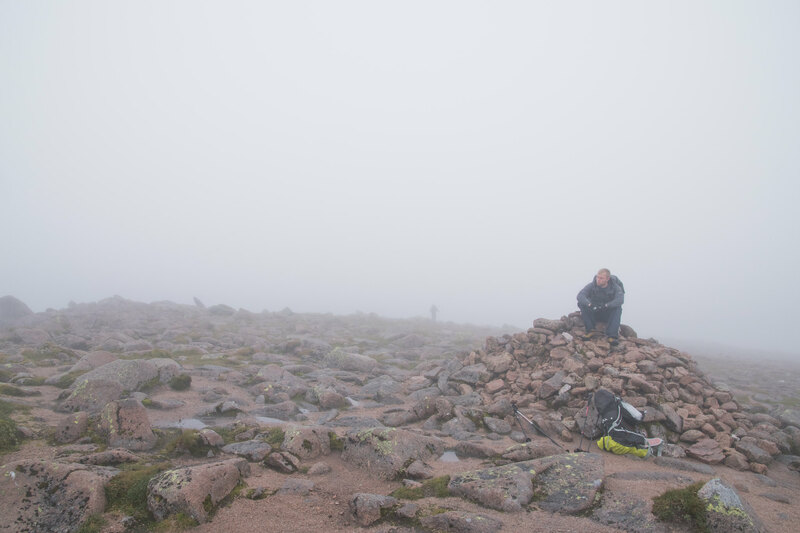 This is my account of what will (may) be my hardest, or longest, outing in my quest to reach the summit of all the Munros and I hope I can do it justice. In all reality it won’t be a short read, but then again this wasn’t a short outing. 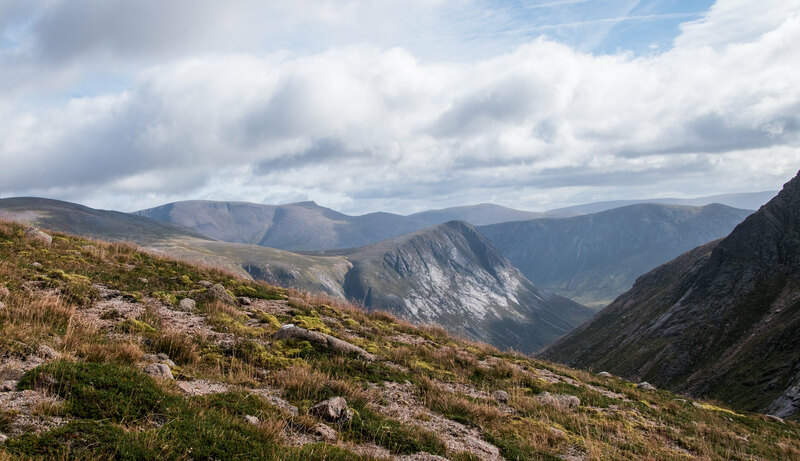 Originally I thought of this route when I was without access to a car (2015) so it made “perfect sense” to walk from Braemar to Aviemore bagging as many Munros on the western side of the Lairig Ghru as I could – I had already done all the Munros east of the Lairig Ghru. Before going into too much detail I think it is best to share the route we eventually took. This wasn’t always the planned route but the differences will be explained in due course. 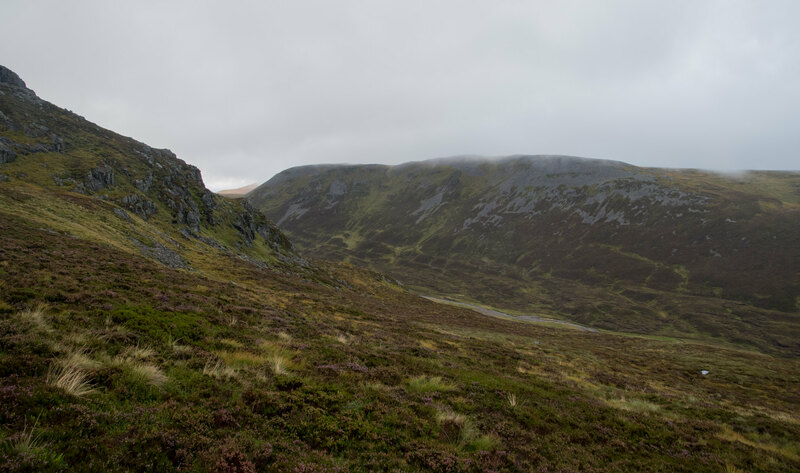 Since the original plan three years ago the route had changed significantly and when we set off now included both Mullach Clach a’ Bhlair and Sgor Gaoith. The plan was intentionally designed to be very flexible and when we began walking, we knew we had a number of easier / safer / back-up options, whatever you want to call them. 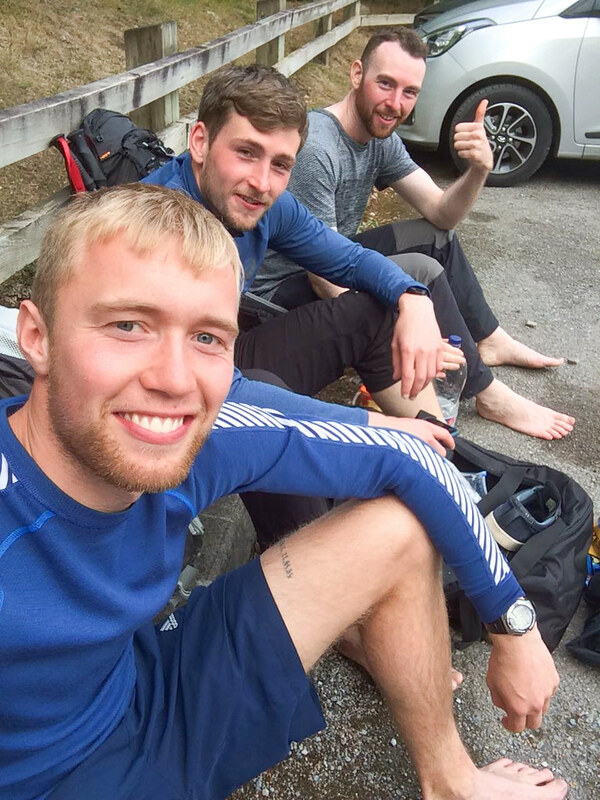 Logistically Andrew and Andrew drove to Aviemore on Wednesday evening leaving a car at the Aviemore Youth Hostel where we hoped to arrive by Sunday afternoon at the latest. 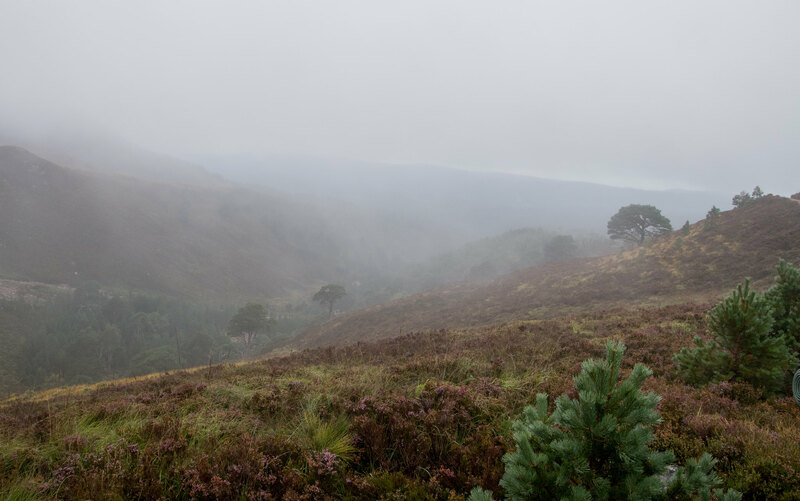 I would then drive us to Braemar on the Friday morning for an early start and Andrew would take us back to Braemar from Aviemore to collect my car, so between the three of us it was a bit of a logistical undertaking. We did consider the bus to Braemar from Aberdeen and train back from Aviemore, but the bus would result in a later start on the Friday. We were already vastly aware that we were undertaking quite a challenge and didn’t want the extra time pressures and uncertainty associated with public transport. This outing had been delayed by one week following a significantly wet weekend prior, which by all intents and purposes served us well; an extra week to recover from the Loch Treig 5 and more confidence in our planned water sources after a prolonged period of unusually dry Scottish weather. You might wonder why, now with the luxury of a car (well three actually), we would keep the route going from Braemar instead of avoiding the 10 additional kilometres to Linn of Dee car park, or why we wouldn’t leave a car at Coylumbridge to shorten the other end by 4.5 kilometres. The answer is as simple as we just loved the idea of making this as hard a challenge as realistically possible, and without any spoilers this is one decision I don’t regret. The first day was predominately along the flat and was meant to be dry until at least early evening. 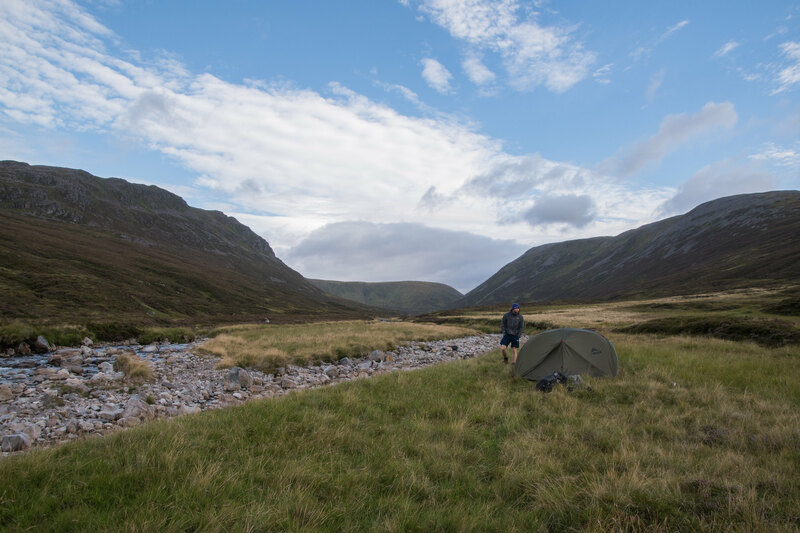 We were not completely decided if we would camp before ascending the first Munro, Mullach Clach a’ Bhlair, or down at River Eidart. 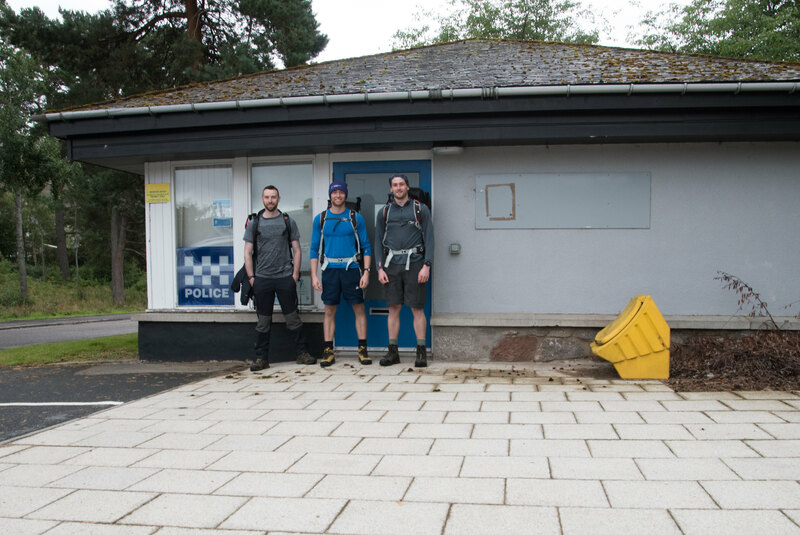 Chat was good, morale was high and it took us until just after the Linn of Dee car park for someone to very sensibly suggest we should maybe ease off on the pace, we were flying along! We reached the White Bridge and took a quick rest and bite to eat before scheduling a more extended 20-minute break at the old cottage near the Geldie / Bynach junction in the shelter of the wind. Between leaving the White Bridge and reaching the old cottage a fighter jet overtook us. Flying overhead tilted perfectly vertical to the ground as it made its way following Glen Tilt. It is really easy to exaggerate in hindsight but I swear he / she just missed our heads! Only joking, but seriously it felt in slow motion and close enough I could clearly see the pilot – 150-200m overhead? Upon hearing the initial noise from behind I just assumed this was an out of body experience or I was dying, but all three of us swivelled around simultaneously and followed the jet overhead, losing all sense of stability before I nearly fell over. Written down it may not sound as remarkable as it was in the flesh but it provided the first of many unexpected energy boosts as we joked and speculated about its flight path. Almost half expecting the start of a world war we were relatively unphased as it would take us until Sunday night before finding out the world was about to end / had ended. Our break at the old cottage was scheduled for a relatively long 20-minutes, but already feeling the effects of walking the 20-minutes went by remarkably quickly. I think we lingered for much longer than planned. Something interesting on the ground, I guess. 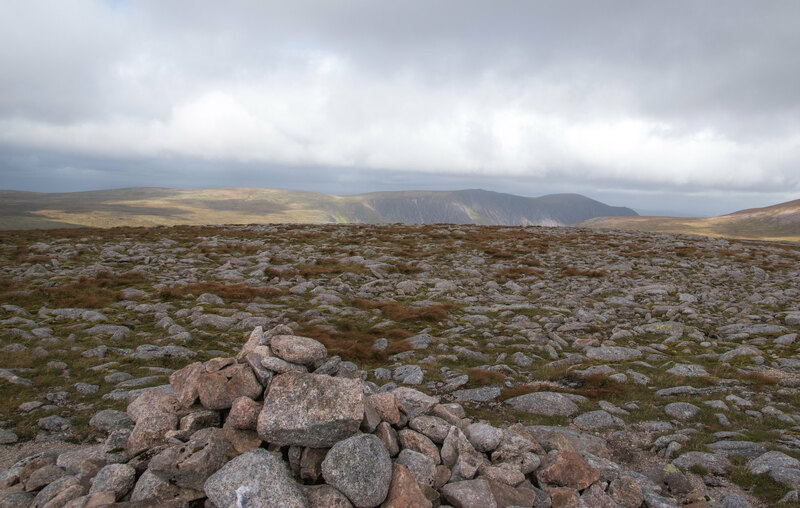 I had already done An Sgarsoch and Carn an Fhidhleir by foot, see my tongue-in-cheek Walk Report – The Ethics of Bagging - An Sgarsoch & Carn an Fhidhleir so I was aware of the distance to the Geldie Lodge Ruins. Unsure if I had the advantage over the other Andrews or not, but I knew we still had a huge amount of walking and number of streams to cross. I wasn’t always trailing behind! 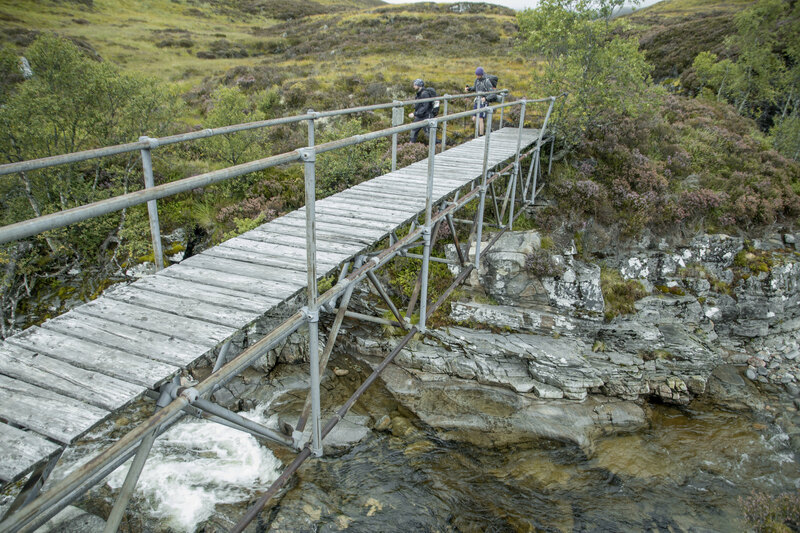 We reached the bridge near the junction of the River Eidart and the River Feshie and made our first ad-hoc adjustment to our planned route. 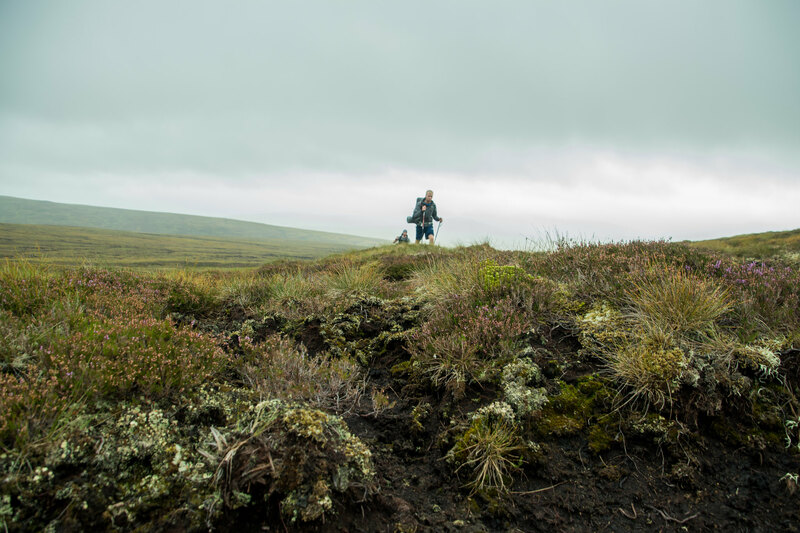 In reality crossing the bog was deemed to be more enjoyable than losing any unnecessary height to get down to the Allt na Sumaig. The bog was challenging to say the least, but welcomed as it involved different muscles than the previously 33 or so kilometres along tarmac and solid landrover tracks. 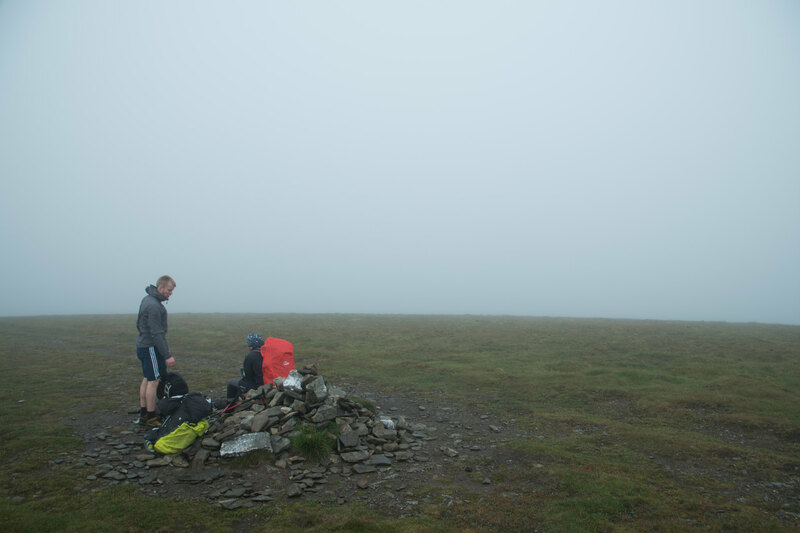 Once in the cloud it was cold and wet but only a short distance to the summit of Mullach Clach a’ Bhlair. Unlike earlier at the old cottage we didn’t linger for too long and set off towards our intended camp spot near the River Eidart where I was beginning to get excited to eat and sleep. *Accidentally knocked camera onto “Scene” setting so the next 3 required a long of correction in Lightroom so may appear a bit unusual. Another decision we made before setting off was to take the tent instead of all three of us bivvying. The weight was almost identical splitting the tent three ways compared to our individual bivvi bags and provided a bit more shelter and the added option for cooking inside if the weather turned nasty. 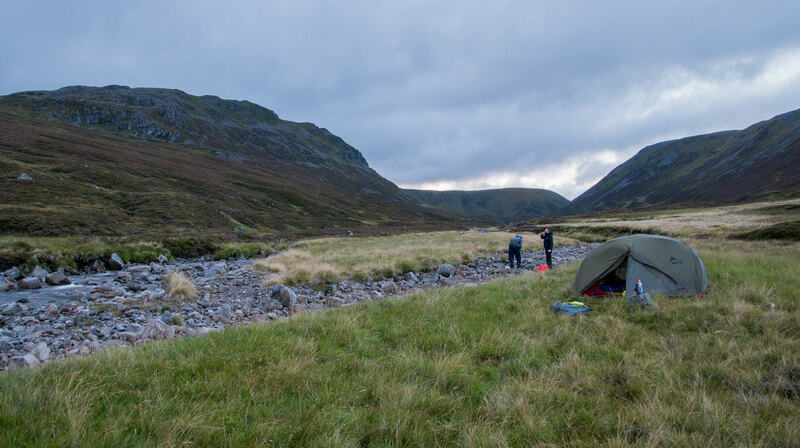 The weather had held out all day but it was forecast to be a wet night so reaching planned camp at the River Eidart it was a bonus to still be dry. 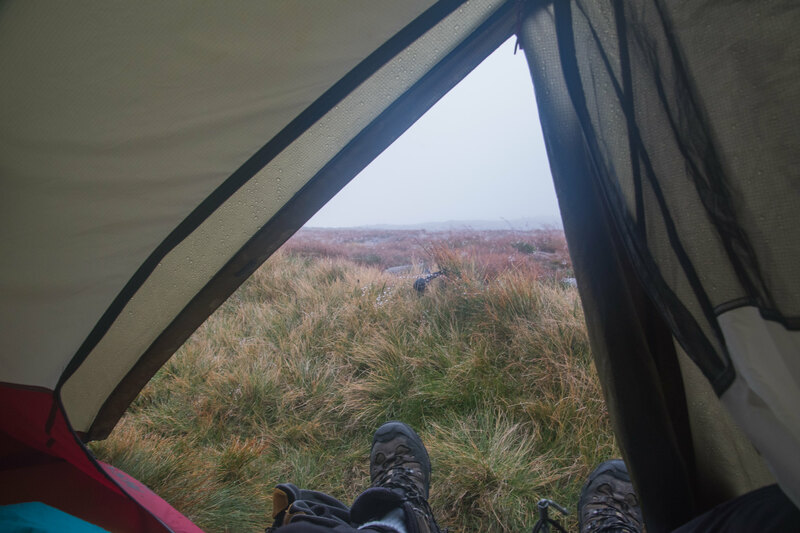 We didn’t waste much time with the two of us setting up the tent whilst Andrew MacD began to cook our first ‘Summit to Eat’, just add boiling water into the bag and wait a long 8 minutes for the magic to happen. 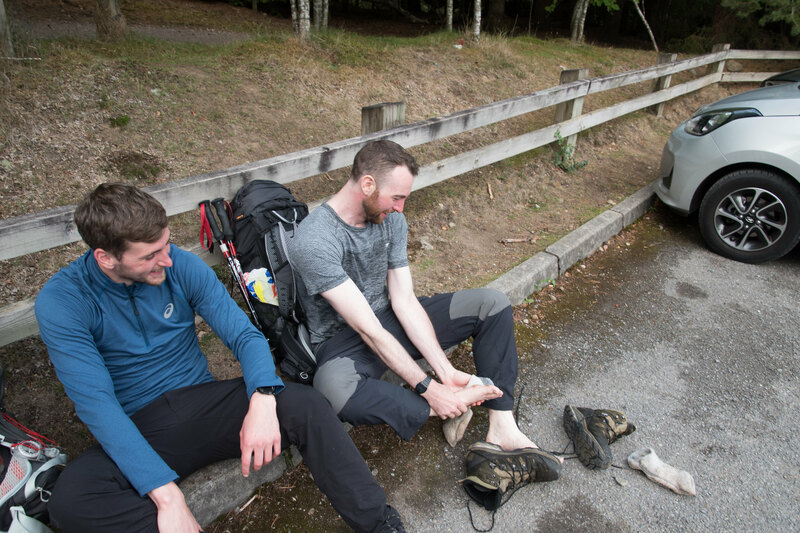 Throughout our previous longer expeditions we had relied on pork pies, sausage rolls and sandwiches as the main energy sources. With this being our first experience of a boil in the bag meals we were all excited, yet equally sceptical of the quality and most importantly whether or not it would fill us up. For our two nights, on top of the collections of sandwiches, nuts and sweets, we took four meals, just in case we needed to spend another night out in the hills. That sounds rather dramatic but given the distance and route planned the likelihood for an, even minor “event” to through us off schedule was relatively probable. This first meal was delightful, Spaghetti Bolognaise if I remember correctly. After walking over a marathon distance, up and down one Munro, it really did hit the spot. What a difference a warm meal makes at the end of a day walking, probably not something worth gram counting on, which I have been known to do recently – I will remember this for the next winter overnighter. 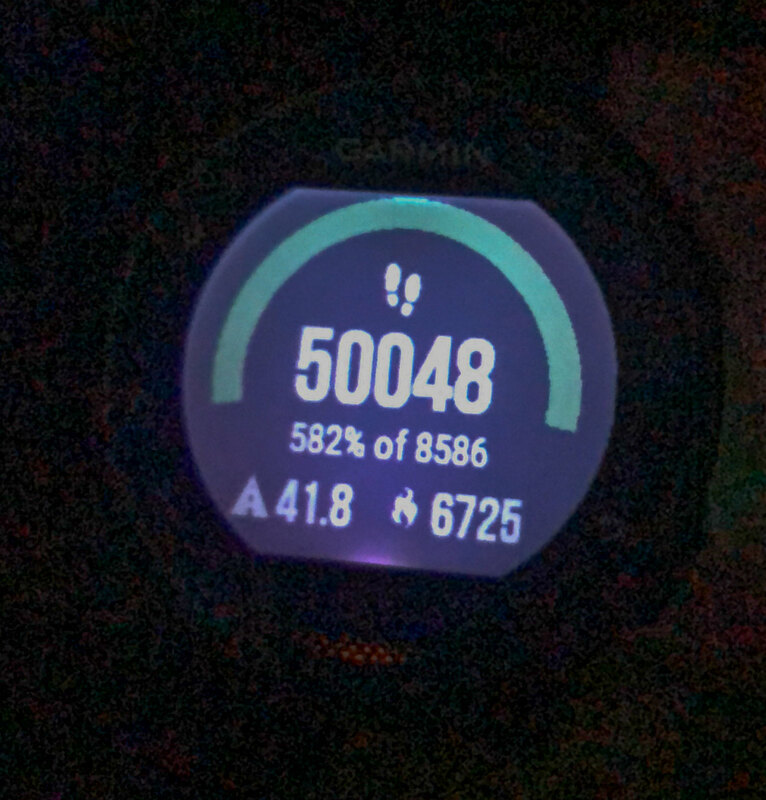 Lying in the tent just before falling asleep I was delighted to see my Garmin watch had exceeded 50,000 steps for the first time (that I have been aware of), 50,048 to be precise. Think the most I had previously clocked up, pardon the pun, was circa 43,000 on a day when running a marathon. We woke on day two with our spirits remaining high, although of none of slept particularly well, possibly a case of being too tired! A big day lay ahead of us straight after a monstrosity of a big day prior. In the weeks preceding hundreds of messages were swapped between us discussing how much of X, Y and Z to take. This was when I was glad I took three fresh pairs of socks. I had limited my clothes to what I set off with, my warmer layers and an emergency pair of trousers in case something went wrong. I can deal with smelly tops, boxers, and trousers but the feeling of fresh socks gets the day off to the perfect start. Confident in our navigational skills we always said if the weather just got too bad, we got too wet, or it was horrendously miserable we would bail down into the Lairig Ghru and would easily be able to make it back to Linn of Dee, or Coylumbridge – maybe wet but nearly certainly safe. It is always nice to realise that when you are revelling in the delightful morale boost received from the fresh socks that they are also putting everything from your normal morning route into perspective; vowing never to moan about a lack of froth from the coffee machine… It inevitably doesn’t last, that is why these outings are so important to do regularly, albeit maybe not quite as long. 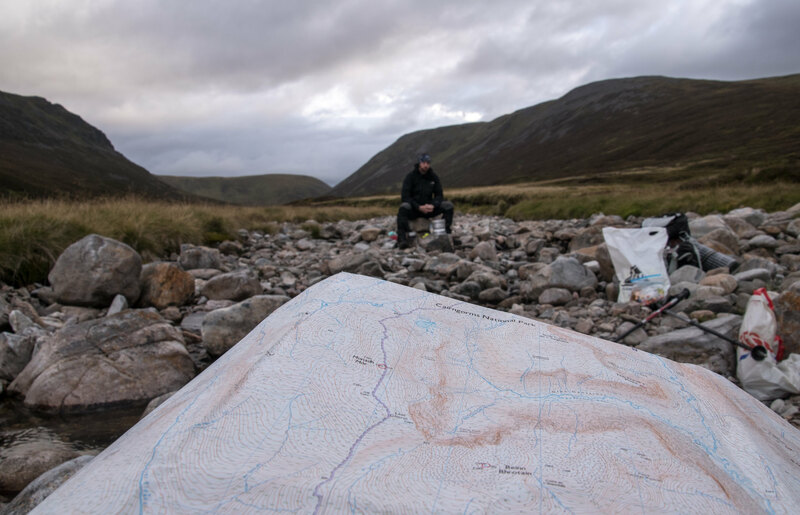 Sitting on the uncomfortable oddly striped rocks with the river flowing between us we got the porridge boiled up and looked at the full map to confirm our planned route on the map and most likely discussed the pint of lager waiting for us in Aviemore in about 36 hours. 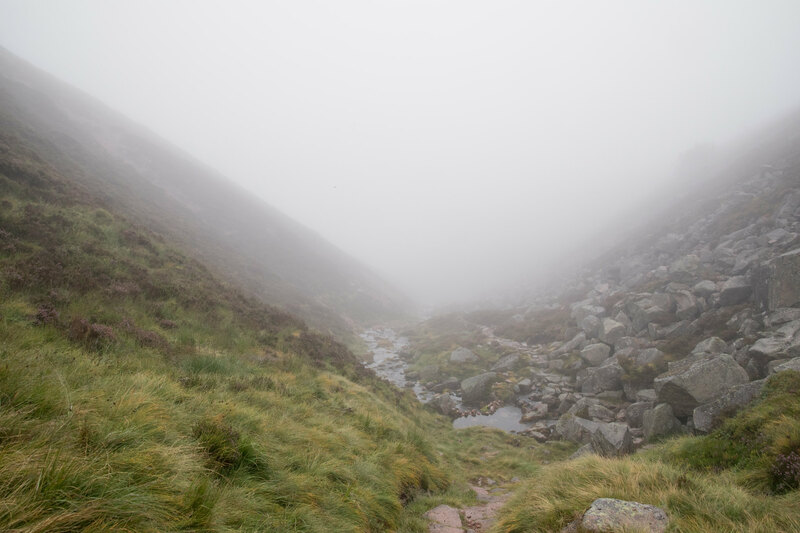 Normally I would try and plan a route that has a bit of a warm-up but this just wasn’t possible and our warm-up consisted of going straight up, well off the beaten track through the heather. 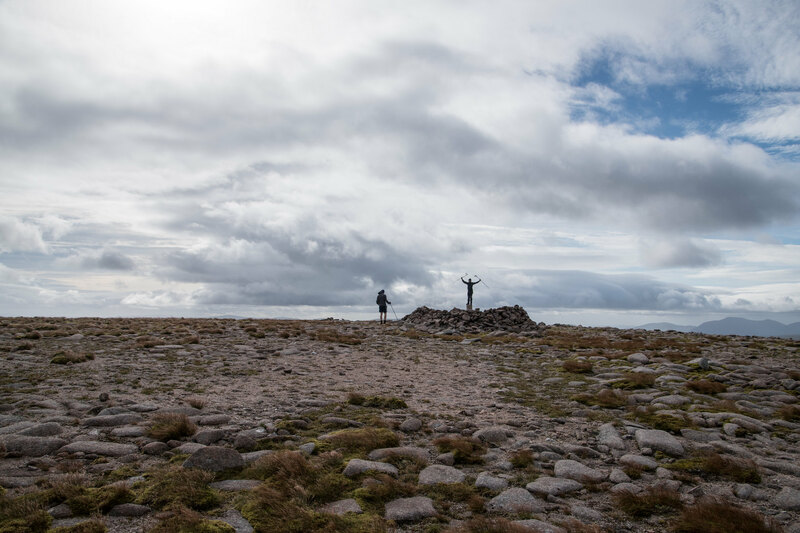 As we gained a bit of height there was a strong wind brewing, but nothing could have prepared us for the wind once we reached the 975m bealach between Beinn Bhrotain and Monadh Mor. Although the views were stunning we were struggling to stay on our feet. On a previous outing Andrew and I had called off an attempt of the Grey Corries ridge a mere 500m away (~100m of ascent remaining) from the first summit due to the wind, and this was bordering on being reminiscent. 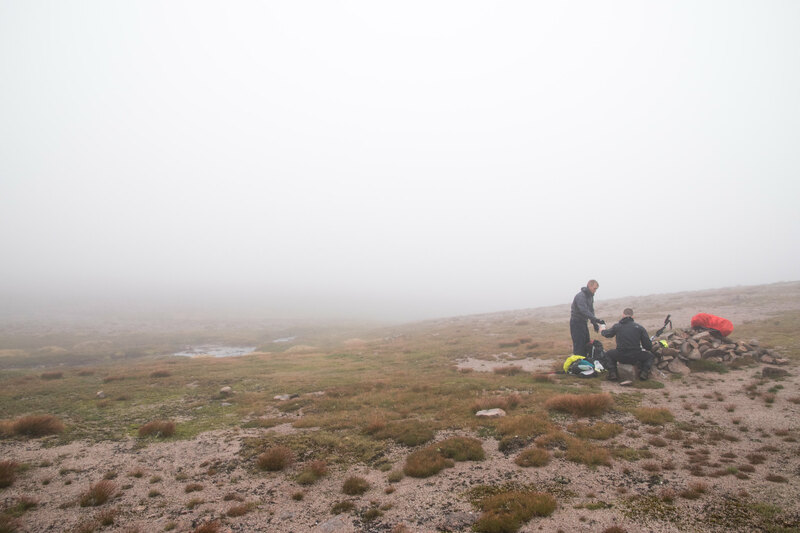 We made the call to stash the bags and make the short ascent up Beinn Bhrotain and hope that the wind was at only so strong due to it being funnelled through bealach. I think I would rather have failed from a broken arm than the wind, especially in such good visibility. Beautiful – struggled to hold camera steady. As is to be expected from three days of walking your physical and mental energy level go on something of a rollercoaster ride. 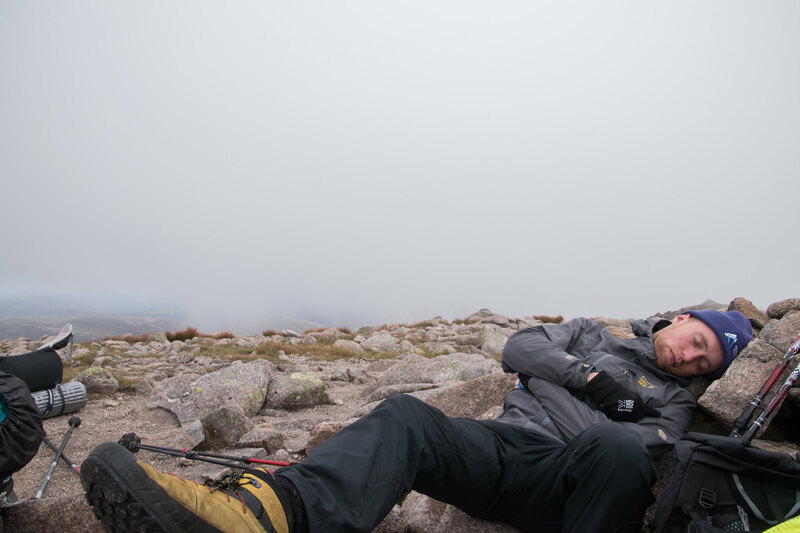 From previously spending numerous 2-3 day-long trips in the Cairngorms on my own it was nearly always more a case of keeping mental / motivational levels high, particularly when the weather wasn’t playing ball. 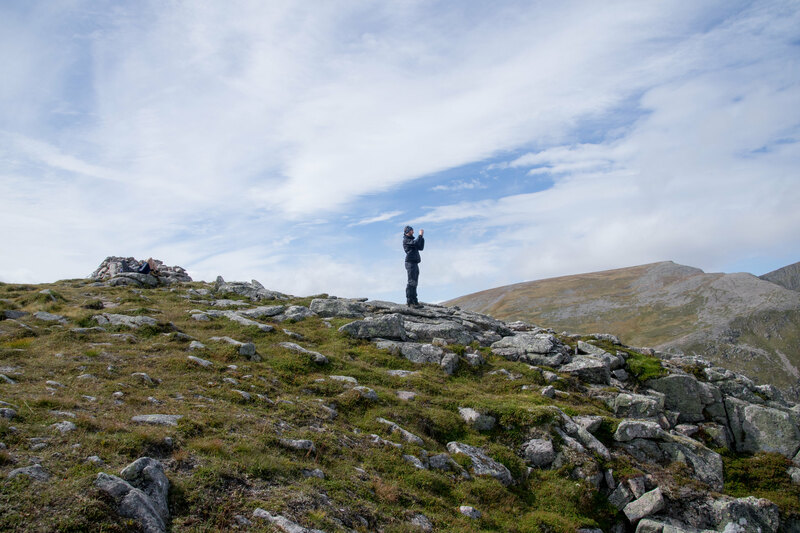 When I planned this route I was convinced it would be a challenge but I was also quietly confident in my physical fitness levels – I was NOT meant to be struggling up Beinn Bhrotain so early on the second day. 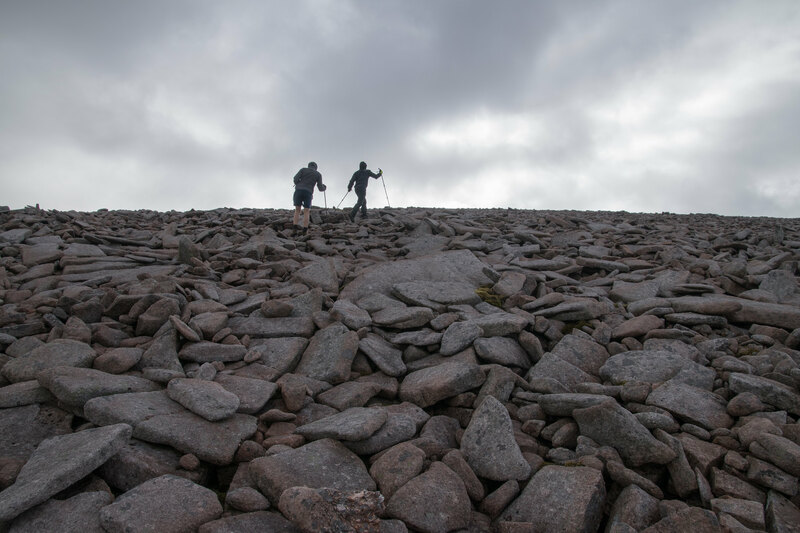 Andrew and Andrew appeared to fly to the top like mountain goats as I was struggling over each and every loose unstable boulder, envisaging what would happen if my ankle snapped – maybe looking back it was more mental fatigue than physical. I felt drained, my muscles weak and my confidence in my foot placement on the boulders was very low. Reaching the top of Beinn Bhrotain was a good relief and we sheltered at the summit, where the wind made it pretty chilly to say the least. Pointing to the horizon with our walking poles we were able to draw our route and realise what a daft route we were planning! Thankfully the next section from the 975 bealach to Monadh Mor was along a well-defined path and the summit of Monadh Mor looked well within reaching distance. 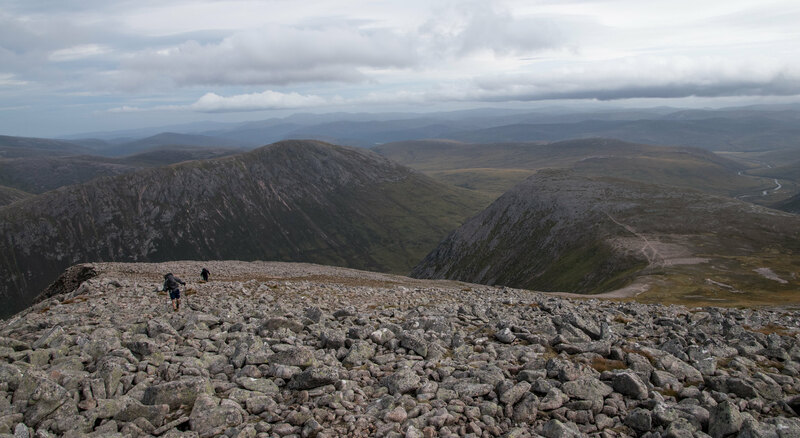 The mountain goats heading up Beinn Bhrotain! 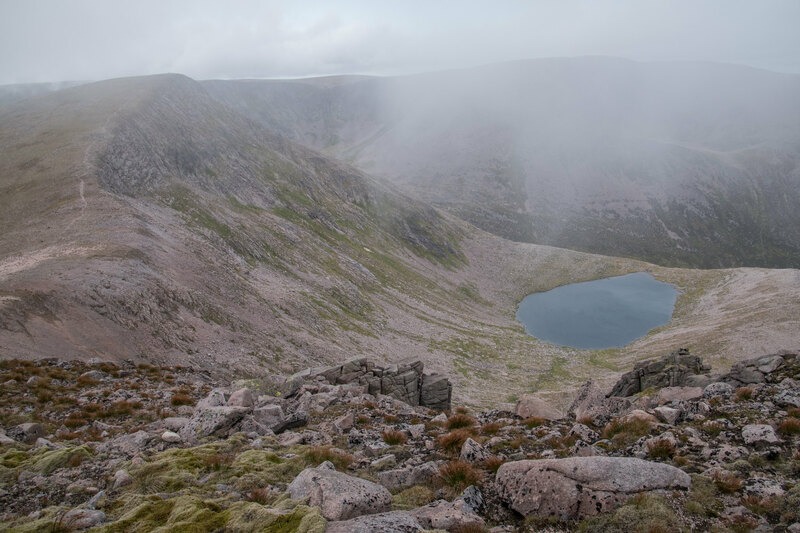 It was still horrifically windy which made walking difficult and talking near impossible, something that is not even remotely unexpected high in the Cairngorms, but equally hard to explain to someone who has never been there. 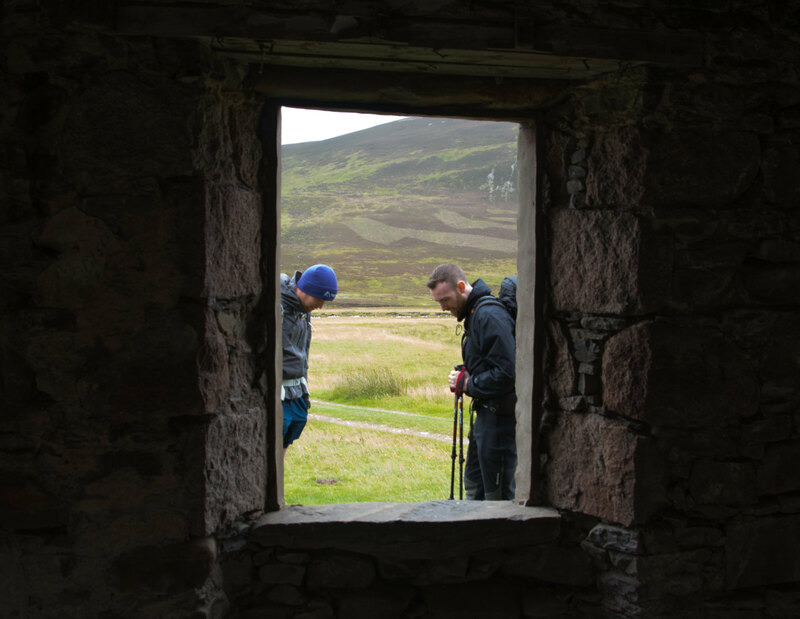 We walked in single file between the two Munros with our own thoughts floating in and out of our heads. I was now feeling slightly more energetic, maybe breakfast takes longer to impact my fuel levels, but I was still worried about not making it, or not enjoying it. When at the summit of Monadh Mor we were able to see what I believe to be Sgor Gaoith. 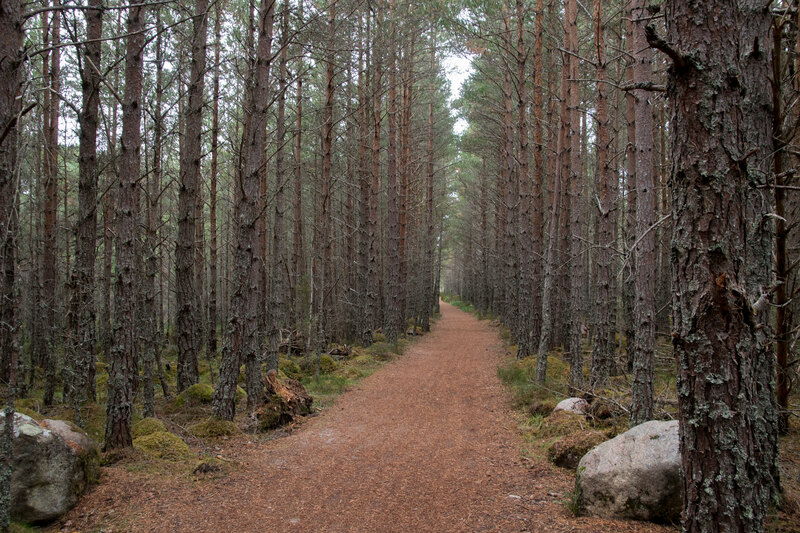 Also aware that to the vast majority of people a 4.5 hour drive to walk up a hill is as ludicrous as it sounds written down so Sgor Gaoith was “close” to Aberdeen, offered great accommodation options in Aviemore, it is (if done the “normal” route) a relatively easy summer day walk. 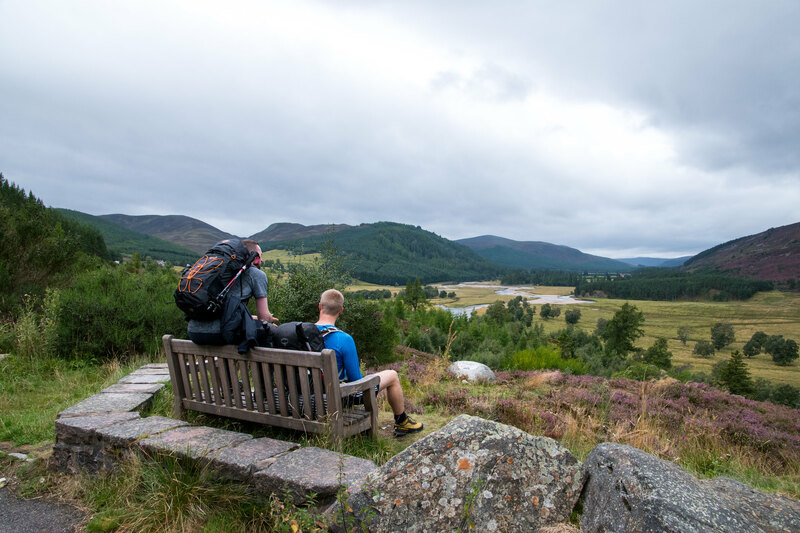 BUT, most importantly it has great views over the Cairngorms. One of the biggest factor in my decision was to ensure whatever my 282nd hill is, that it offers spectacular views, or at least has the potential in good weather, or I would run the risk of, “is this all you do it for”. The temptation when planning this route was to avoid Sgor Gaoith, but there clearly must have been a stronger temptation as at this point in time it was firmly included! 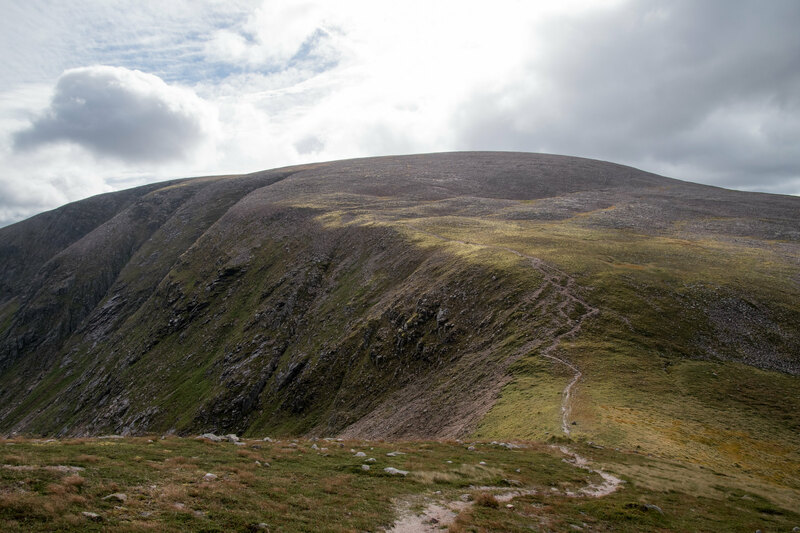 We had a quick discussion, on whether or not it would it be possible to reach today, obviously still going via The Devil’s Point, Cairn Toul / Carn an t-Sabhail and Sgor an Lochain Uaine (The Angel’s Peak). Our conclusion was we had no idea, we would make a call when we would have to detour from the path. We didn’t spend long at the summit and made our way back off the beaten track on route to Loch nan Stuirteag and Allt Clais an t-Sabhail. Our intention was to get out of the wind and have a bite to eat before planning the exact route we would take with the main goal of losing as little elevation as possible. 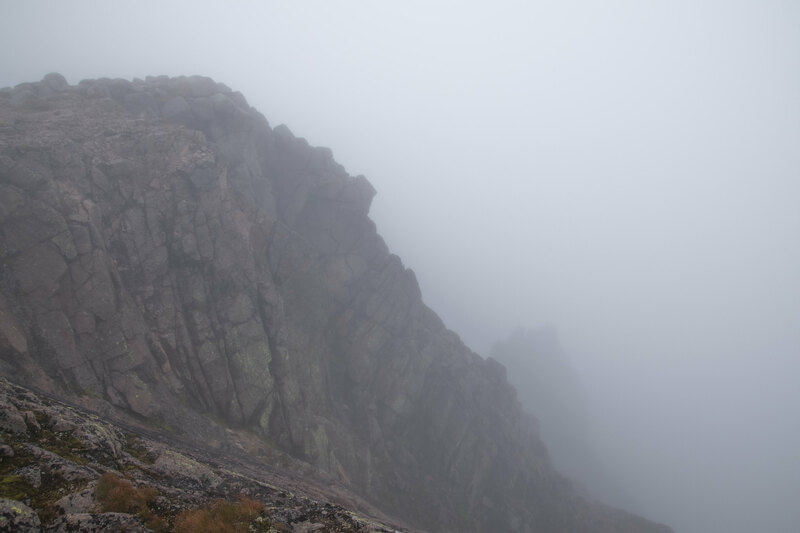 Thankfully for us the weather was clear, so when munching on another boil in the bag lunch it was a pretty clear decision that we would contour around Stob Coire an t-Saighdeir and then make a straight-line ascent towards The Devil’s Point. 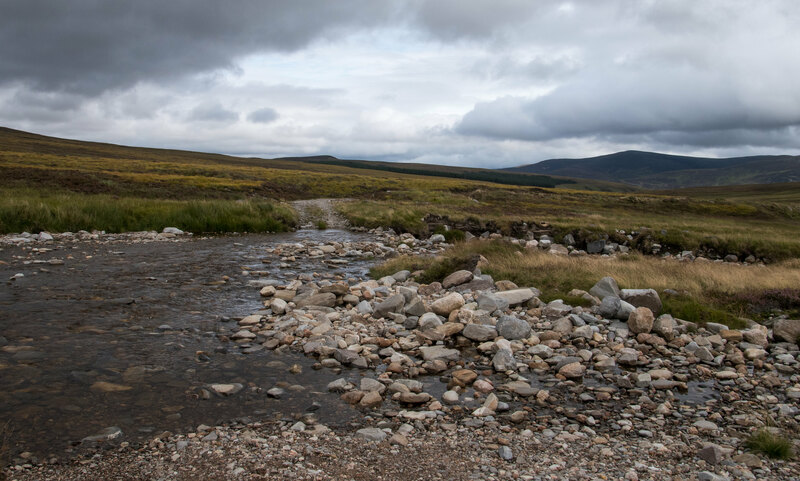 When we reached Allt Clais an t-Sabhail, we stopped to fill up water bottles and I accidentally let go of mine, watching it flow down the stream at a frighteningly quick pace, only slowing when a rock got in its way. Probably stupidly in hindsight but without thought I decided sprinting down the hill, jumping over loose rocks was a good idea. Amazingly the bottle somehow got stuck on a lip before it would easily have been gone for good and I was able to retrieve it. Unfortunately, I was now left with an additional 20m of walking uphill that I did not want to do! It felt like more of an inconvenience than it sounds. 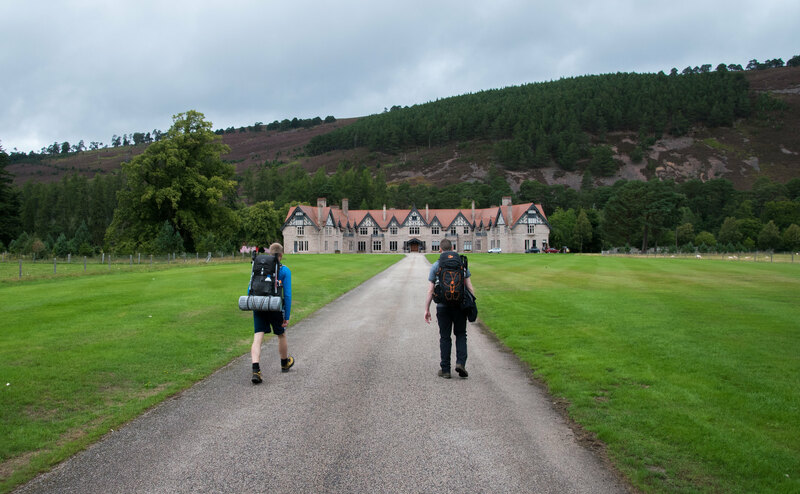 Unsurprisingly, other than the assumed DofE group walking from the Glen Feshie direction on day one we had what felt like the entire Cairngorms to ourselves. 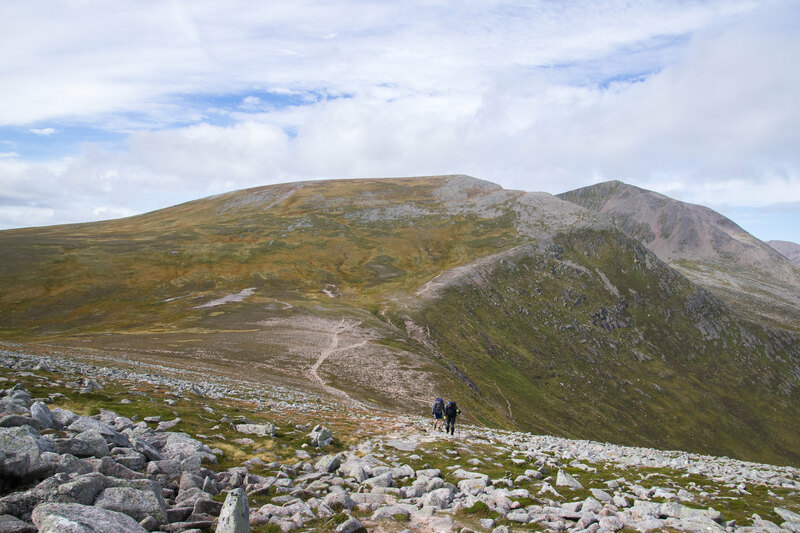 Once walking again and on route to the “sexier” hills of The Devil’s Point, Cairn Toul / Carn an t-Sabhail and Sgor an Lochain Uaine (The Angel’s Peak) we knew it was likely to be our last bit of peace and quiet. I think it was when we stopped for a rest before making the final push up The Devil’s Point Andrew and Andrew both mentioned some knee pain. I didn’t think much of it, and equally they didn’t make much of it, it seemed more a passing comment similar to those we had banded about since leaving Braemar. I went ahead hopeful to get to the summit before the slowly approaching clouds wiped out our views and what views they were! The wind somehow died, and the views were stupendous – this was worth the walk in on its own. I can’t actually remember if the winds did indeed die, but it makes the story more “fitting”. From where I was standing I was able to see other spots I had camped high in the Cairngorms, including just off the summit of Carn a’ Mhaim. 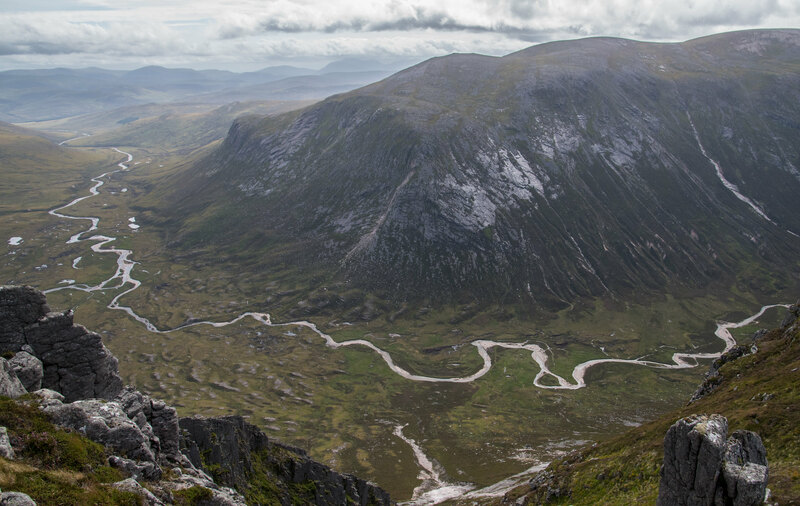 I remember camping off the summit of Carn a’ Mhaim looking at The Devil’s Point thinking that looks tiny! Much has changed since this, most noticeable the weight and size of my backpack has halved but I am probably much more suitable equipped. The Devil’s Point did indeed feel tiny, but if you put this hill in Glencoe it would appear massive. The Cairgorms are just in a league of their own in terms of height. On the descent down towards Stob Coire an t-Saighdeir both Andrew’s were clearly struggling, more than they had suggested earlier. Or maybe I subconsciously ignored their earlier comments on knees in a hope that ignorance would magically repair their knees. 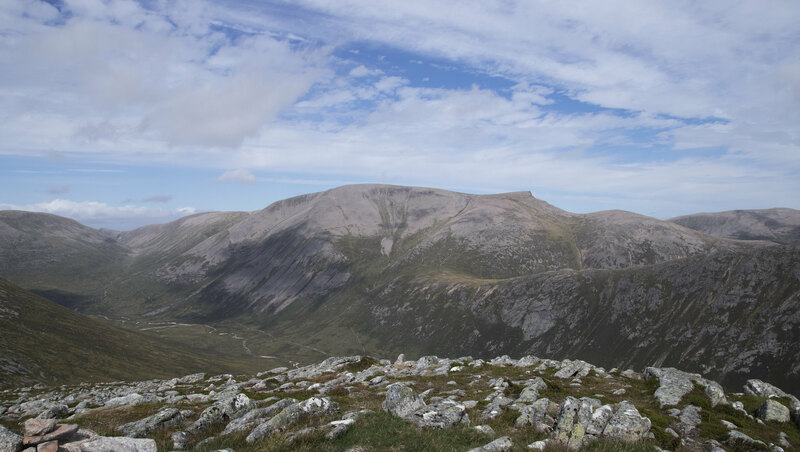 In the midst of wondering if maybe bailing out into the Lairig Ghru would be a good option we walked across 5-6 bags that another young group heading up The Devil’s Point had left to save weight. They had also left a camera filming / taking a time-lapse and the urge to pull some silly faces was just too much. 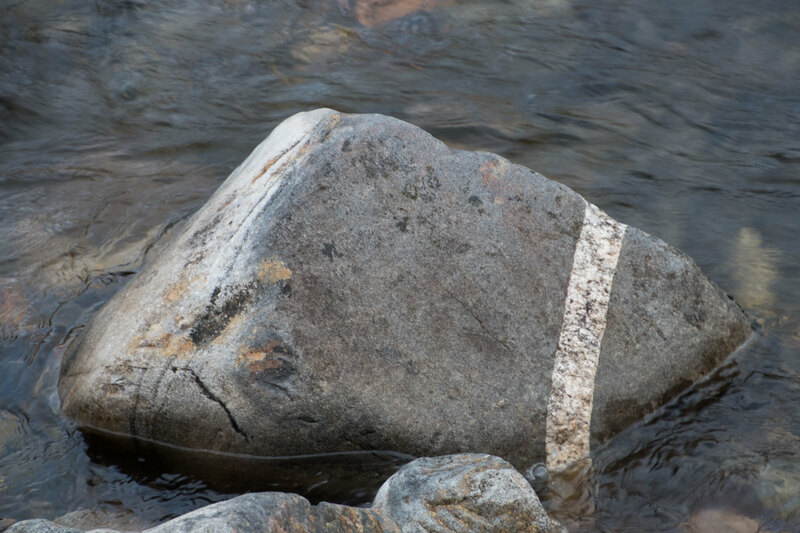 This, along with the bottle rolling down the stream were somewhat minor events but somehow they have stuck in my memory, and will be stuck forevermore after writing this! Heading up the boulders towards Stob Coire an t-Saighdeir it was windy again and Andrew and Andrew’s progress looked horrendously painful. 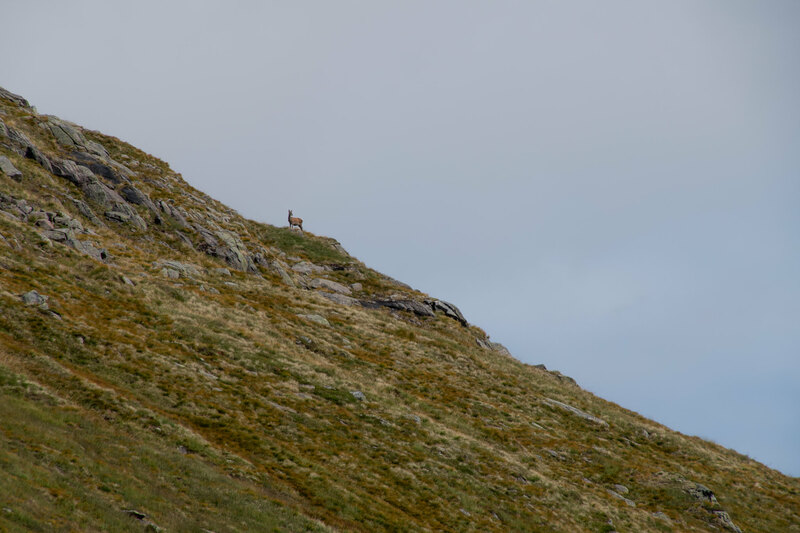 I kept them in sight before reaching Cairn Toul to shelter from the wind. It was clear that Sgor Gaoith was out of the question, it would have been daft, stupid and unsafe to even consider attempting. Annoyingly, I felt amazing, yes annoyingly. Both Andrew’s were insisting that I head off and do Sgor Gaoith on my own and come back where they would set up the tent for my return. Obviously, I contemplated and weighed up the pros and cons. 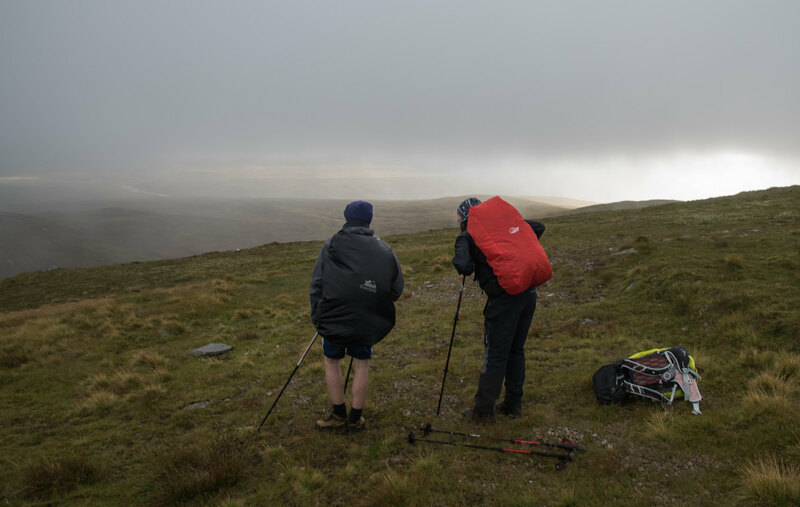 The idea of doing what I had originally planned to be my final Munro with all my family and friends, on my own in deteriorating weather conditions late in the day when on a team outing would have been asking for something to go wrong. I don’t think I actually ever thought about doing it on my own and I remember insisting I wasn’t even in the slightest bit annoyed in answer to Andrew’s questions. I am sure that I was being truthful in my answer but at the same time I was slightly disappointed, in some bizarre aspect it would result in a “failure”. 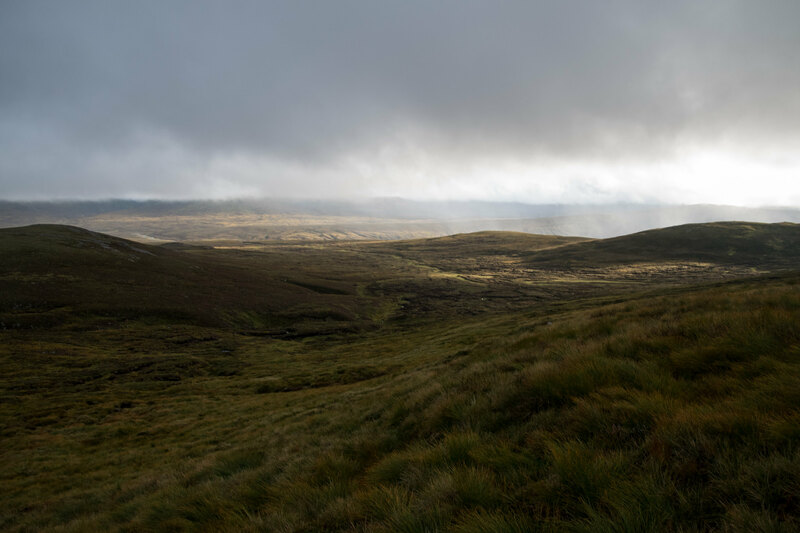 We set off on the short distance from Cairn Toul to The Angel’s Peak and made the decision to set up camp as soon as we found somewhere in even the slightest bit of shelter. When we reached about 1130m we set up the tent and cooked up our grub before eating inside the tent and heading off to sleep. 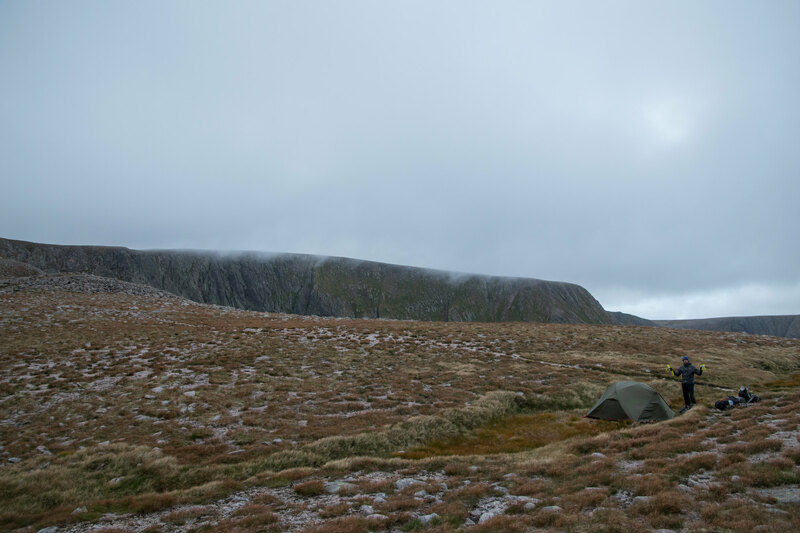 This would probably be my highest camp – although I have done a number of high camps the majority of the hills have been smaller than this. Again, for the second night in a row none of us slept particularly well, but the main thing was that it was warm and dry. 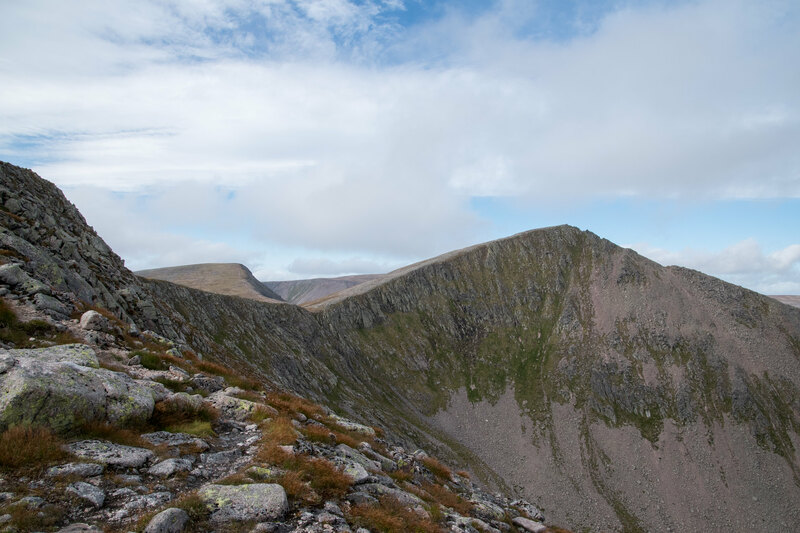 When we woke in the morning the reality was Andrew and Andrew were a bit injured and we still had a very long walk back to Lairig Ghru, and by now heading over Braeriach made the most sense. Much to our amusement once I had my glasses on we woke to find Andrew MacD sleeping with hat and gloves on. Even now writing this it doesn’t sound in the slightest bit funny, but at the time it was hilarious. The tent was roasting throughout the night, even at 1130m high. The weather on day one was calm, clear and overcast with consistent threat of rain. Day two was amazing visibility with beautiful views but a ferocious wind for long periods. Day three was silent, low lying deep thick cloud. This actually worked quite well. Day one was meant to be a long “boring” walk and the main goal was to stay dry, which we did. Although the wind on day two was a bit annoying we were spoilt with the views. Day three it was more about safely making it off the hills, so no wind was a massive boost, we were confident in our navigation and the views weren’t as important as the finishing pint was. Because the tent was now soaking wet we decided just to pack up and eat breakfast once we our bodies were warmed up. We did so and at the Wells of Dee we cooked the last pack of our ‘Summit to Eat’, Spaghetti Bolognaise for breakfast – delicious. It was uneventful, but we did reach Braeriach and now we had what should have been a motivational boost knowing that the entire remainder of the walk was downhill. When I say should have, I hadn’t taking into consideration that the other two Andrews’ knee pains were predominantly limited to walking downhill. Remarkably it was peaceful on the summit and we spent a bit of time contemplating what our next move would be. 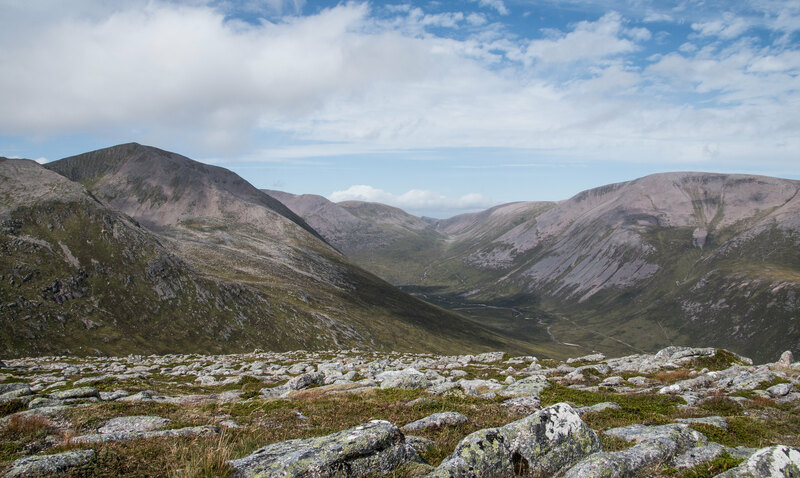 Would we get to the Lairig Ghru, and then detour via the Chalamain Gap towards the Sugarbowl car park and hitch a ride or would I run ahead and get Andrew’s car and meet at Coylumbridge. 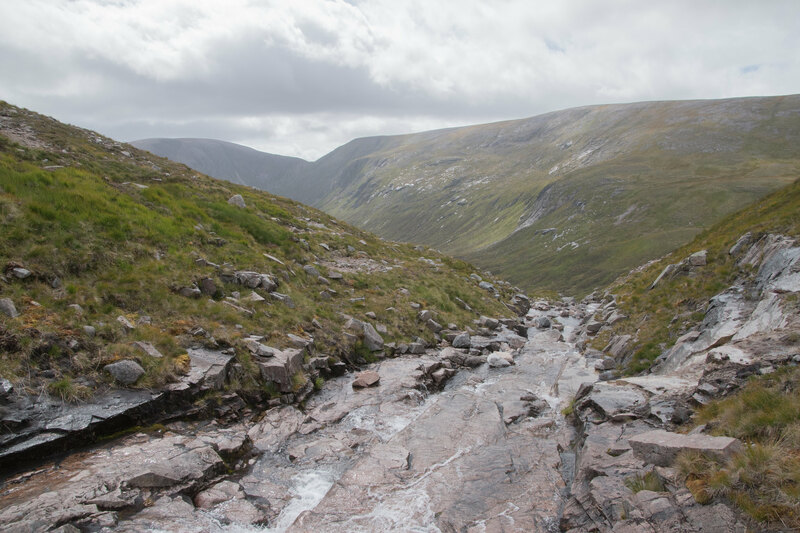 The descent from Braeriach to the Lairig Ghru was soul-destroying, slow and tedious. Conversation ran dry and we spent what felt like half an hour in complete silence before Andrew T suggested playing a nursery memory game. It worked and again boosted spirits, or at least it felt like it did. Next we were taking turns in listing different types of beers. 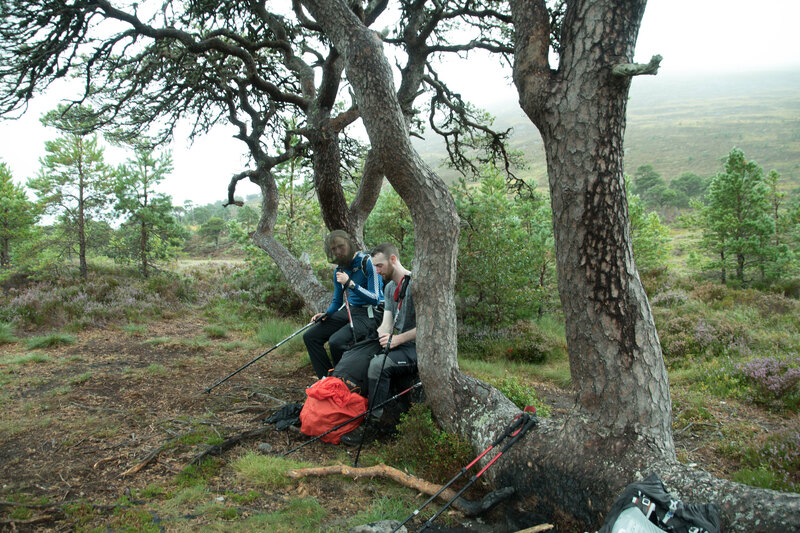 We must have listed just about every single available beer worldwide, and before long we were back on the Lairig Ghru. Unfortunately the lack of wind meant the midges were out in force and we were still high in the clouds which made it appear quite mystical. 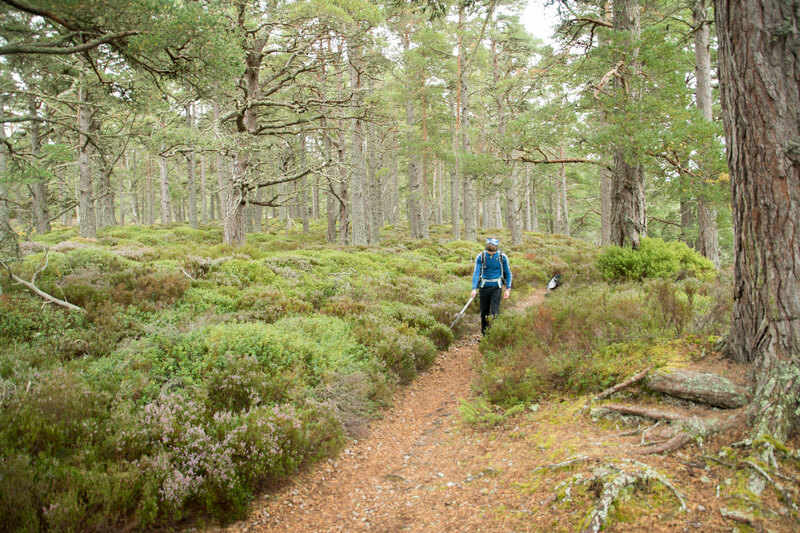 We held a really steady pace, deciding against the Chalamain Gap, until we reached the beginning of the Rothiemurchus Forrest. *Again knocked camera into the wrong setting. By now Andrew MacDs’ knees appeared to be completely giving up. He was quite remarkable in his insistence and confidence of making it to Aviemore, I think the phrase “we’ve come this far, I’m not stopping now” was used on a few occasions. 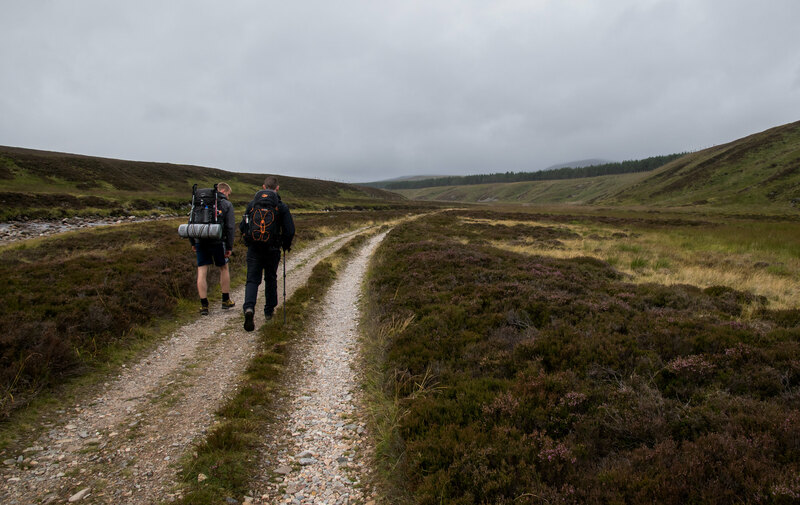 Now that we were off the hills, I wasn’t overly concerned anymore, knowing that we had solid paths and loads of passers-by between here and Aviemore Youth Hostel in the event conditions worsened. The route to Aviemore was gruelling for different reasons. I just wished I had felt exhausted, feeling fresh(ish) made the slow pace for more of a mental challenge. Part of me wanted to be asked to get to Aviemore and pick up the car and return to Coylumbridge, but more importantly I wanted us all to finish together. We still found ways to make fun, including practicing being blind. Amazing how much the other senses heighten. It is incredibly difficult to explain the pace, but with a number of hours of daylight it wasn’t really any concern. For those that know typical walking paces, we were averaging about 37 minutes per kilometre… This was slow by anyone’s standards. What amazed me was once we were alongside the main road into Aviemore from Coylumbridge was the amount of people that passed and didn’t stop, some slowed for a closer look right enough. It would have been impossible not to notice that we were struggling. In fact only one car stopped just outside Aviemore, a young lad, in the smallest of Mini’s with the seats down and covered in sporting kit, sailing / surfing maybe. He passed us and turned back to see if we needed any help, convinced that he could fit us all in. We were now only about 1.5kms away, and there was no way we were going to quit now – but the offer was nice and reassuring! Reaching the car at the Aviemore Youth Hostel was an absolute buzz. 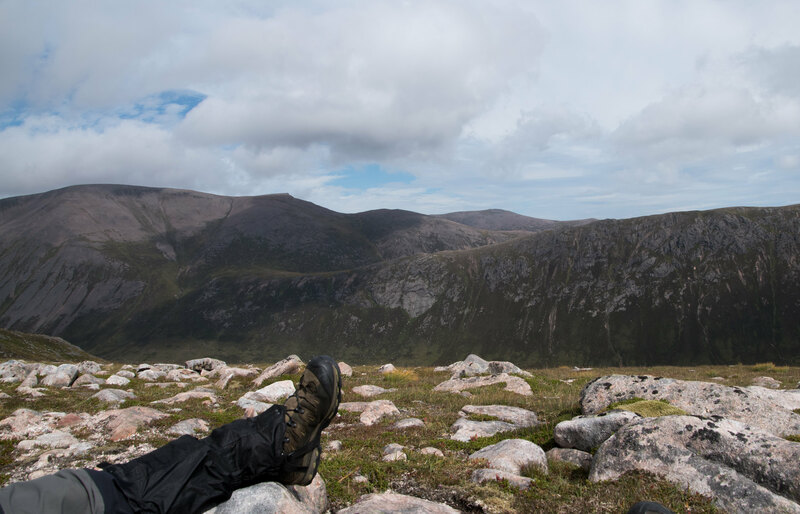 The previously 10(ish) kilometres from reaching the Lairig Ghru had been mentally and physically exhausting, more mentally for myself but we had made it! I said I wasn’t struggling physically, that was until I took my walking boots off. 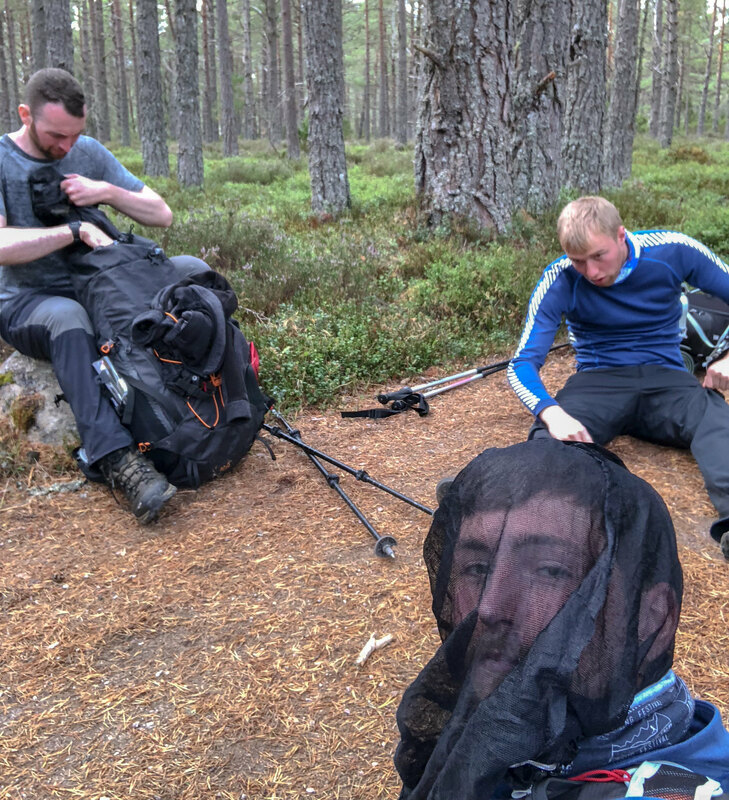 I had been noticing they were getting hot and itchy since on the Lairig Ghru, but I just assumed this was down to the solid path which I hadn’t been used to. As soon as I took my socks off my feet felt amazing, yet seconds later insanely painful. It was as if they had been set on fire. I poured some water which helped briefly but the walk from the car 20 meters into the hostel it was as if I was walking on a bed of nails – it was honestly excruciating. Alive, weather beaten but alive. We had a quick shower (thankfully our room was right next to the toilets and showers!) and almost instantly headed out for the long awaited pint of beer at The Old Bridge Inn, we knew if we waited any length of time we would have just crashed and burned. We sat outside, because inside was mobbed, and to get some fresh air - not as if we had had enough. Unsure if it was just because of the physical exertion but that first pint was like a bee drinking nectar, so sweet and nutritious. Next we headed to the Cairngorm Hotel for dinner and another few beers. After spending 3 days in near complete solitude, Aviemore seemed like the busiest place on earth, this in its own right was exhausting! I remember Andrew T coming back from the bar looking shell shocked after ordering three lagers - turned out he forgot how to speak to a female! It was only three days!!! After dinner (and another couple of beers) we sat in the bar and had a celebratory double whisky and were already reminiscing about events from the previous few days. How the plane nearly hit our head, how the weather was perfect, how Andrew might never walk again, how listing different beers saved us but most importantly how we were all glad we stuck together and finished what was one monster of a route. The first of many, many occasions where we will likely reminisce about this outing. 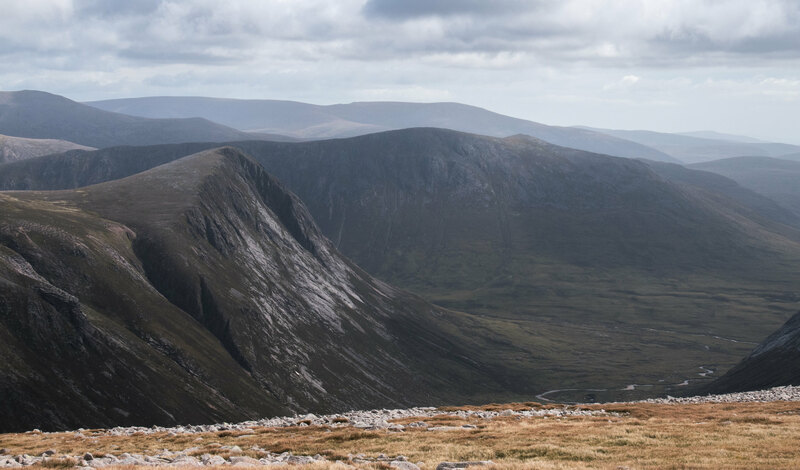 We are under no illusion that the Cairngorms will have seen some epic adventures and we rightly know this wouldn’t even be near the top quartile but for us it was one heck of an outing. Reckoning we covered roughly 80-90km (once you take into consideration zig-zagged waking) over the 3 days (many of which were on no path), carried all our gear, navigated without any major issues and most importantly made it to that much thought about pint of beer alive but slightly sore. Also discussed and promised that we will do it again, in reverse, but this time making sure Sgor Gaoith is included. 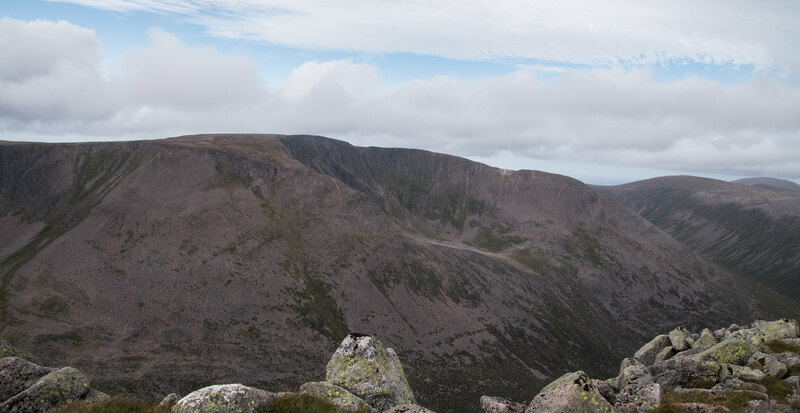 This outing meant I had done nearly all the Munros in the Cairngorms and inevitably my next year or two will have more focus on the ridges in the North West and Skye, which bring a different but equally exciting challenge. 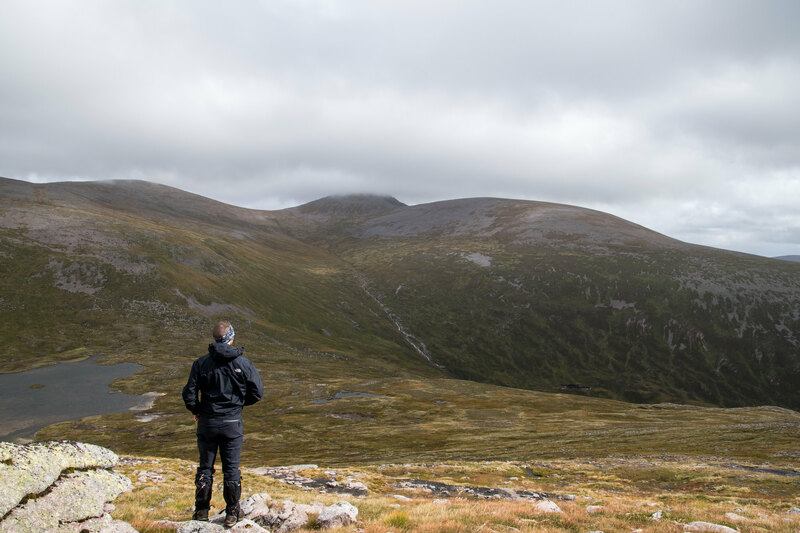 I have read a couple of Walk Reports or social media posts stating that the Cairngorms are boring / easy and nothing in comparison to those of Torridon, Skye or even the Arrochar Alps, but for me they are, and always will be my favourites – I can’t wait to return. Don’t tell me those seven Munros were easy! Massive thanks to the two other Andrews’ for joining me on this outing, providing unrepeatable banter, and I hope they are looking forward to doing it in reverse! Spectacular Andy! 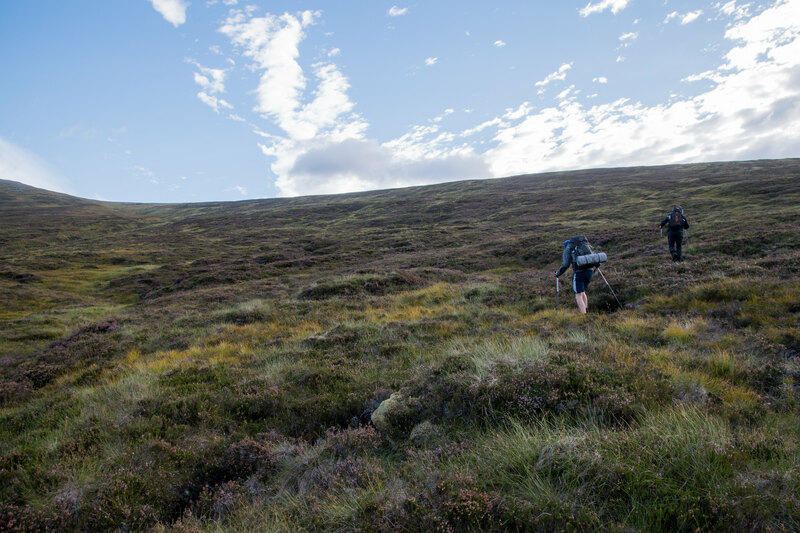 Haven’t walked in the Cairngorms so far but have always had an inkling my route would be similar to yours - walking in the clag (and with pals!) can sometimes be a hindrance but you all made it through without incident. Maybe you’ll find yourselves on a time lapse on a DofE video!